Our ZENOAH MODIFIED CYLINDER HEAD KITS offer the DIY RC Hobbyist the ability to upgrade their engine to perform just like our RC Racing engines at an affordable cost. Get the reliable horse power gain that you desire! 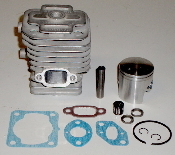 Pro Modified Zenoah top end kits for GR270RC, Helicopters and Airplanes the PUH Cylinder. Substantial "Increase In Power"
As a reminder: Anyone that is offering a 'top end kit' with a stroker crankshaft the engine will not be at it's optimum, even though it performs well It doesn't make sense to pay for something that is not 100% correct. All Top End Kits that are going to use a stroker crank shaft we prefer the complete engine to set up all the modifications correctly, since it is not a 'bolt on and go' process as one might believe. Direct replacement for the Zenoah TERMINATOR or other Zenoah 4 Bolt Cases. Re: PUH. Make your Stock Zenoah a 6.5 HP engine with a tuned pipe. Direct replacement for the Zenoah DOMINATOR or other Zenoah 4 Bolt Cases. Re: PUH. Make your Stock Zenoah a 7.2 HP engine with a tuned pipe. Direct replacement for the Zenoah TERMINATOR or other Zenoah 4 Bolt Cases. Re: G240RC / G270RC / G290RC. Make your Stock Zenoah a 6.5 HP engine with a tuned pipe. Direct replacement for the Zenoah DOMINATOR or other Zenoah 4 Bolt Cases. Re:G240RC / G270RC / G290RC. Make your Stock Zenoah a 7.2 HP engine with a tuned pipe.